ST. CROIX, U.S.V.I., April 1, 2019 — St. Croix Foundation is pleased to announce that the second cycle of the Patrick and Amelia Williams Opportunity Fund for St. Croix youth opens April 1, 2019. Geared towards providing opportunities for St. Croix students to pursue their career goals through colleges or universities, scholarships not to exceed $5000 will be awarded to successful applicants. All applications will be reviewed on the basis of residency, school attendance, and GPA. The Patrick and Amelia Williams Opportunity Fund was established in 2018 by Junior Gaspard, a native of St. Croix and graduate of Central High School and John H Woodson Junior High School, who wished to honor his grandparents, Patrick and Amelia Williams. The Williams’ hard work, determination, and resilience is a legacy that Junior Gaspard and his family are committed to passing down to further generations, providing opportunities for St. Croix youth to overcome any obstacle with strength and perseverance. The Patrick and Amelia Williams Opportunity Fund will provide up to two scholarships a year with all scholarship recipients required to report on their successes and challenges throughout the year. This process will ensure that the Fund continues to meet current needs and to provide students with additional support if needed. Applications are due by May 10 and applicants will be informed by decisions by June 1. The full application guidelines can be found on the Foundation’s website at www.stxfoundation.org. Applicants are encouraged to apply online; however, applications may also be mailed/delivered to St. Croix Foundation’s office at 1023 Market Street, Christiansted, VI 00820. 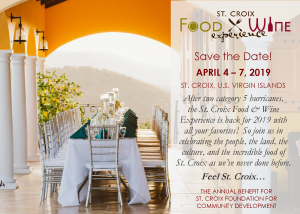 St. Croix Foundation for Community Development is pleased to announce the event lineup for its annual benefit, the 2019 St. Croix Food and Wine Experience. A series of culinary food and wine events held on the island of St. Croix, U.S.Virgin Islands from Thursday April 4th through Sunday April 7th, 2019. The St. Croix Food & Wine Experience is a celebration of the people, the land, the culture, and the cuisine of St. Croix. Now in its 12th year, St. Croix Food & Wine Experience (FWE) has a long history of promoting not just St. Croix but, holistic community development through the work of St. Croix Foundation. An outgrowth of the “culinary extravaganza” A Taste of St. Croix, the Food and Wine Experience is today the annual fundraiser for the Foundation and has enabled the 28-year-old organization to advance its mission of encouraging greater philanthropic activity, marshaling resources, and acting as a catalyst to benefit the people of the Virgin Islands. While A Taste of St. Croix and the FWE have existed as independent entities since 2016, the impact of both events has brought international recognition to St. Croix and has elevated St. Croix’s brand as a bona-fide culinary destination. Over the past three years, St. Croix Foundation has been committed to ensuring that every event, every project and initiative attached to its name, is perfectly aligned with the organization’s mission and programmatic priorities of community revitalization and holistic community development. This year, St. Croix Foundation is proud to be taking all necessary steps to truly embody the 2019 theme for the Experience: ‘Feel St. Croix.’ With a commitment to emphasizing St. Croix’s special characteristics, St. Croix Foundation is expanding partnerships with community stalwarts Bohlke International Airways, balter restaurant, and Southern Glazer’s Wine & Spirits, as well as forming new friendships with community revitalizers like the Caravelle Hotel and Casino. As the Foundation seeks to really ground the FWE this year, two of the Experience’s events will serve culinary delights that are 100% locally sourced. And with additional surprises in store, St. Croix Foundation is certain that this annual celebration of the people, land, culture, and food of St. Croix will be like never before. bond @ balter – A special invitation only reception, an evening of celebrity chefs, exclusive spirits, and delectable appetizers await sponsors, partners, chefs, vintners, and media at balter restaurant and creates the perfect ambiance for active, passionate philanthropists to meet and mingle. 4:30 PM Thursday. Cork & Fork – The cosmopolitan Cork & Fork Dinner returns for 2019! SCF is a hardworking organization, and the FWE is the one time each year, when the Organization reaches out and asks for the community’s support! Since its founding in 1990 following the devastation of Hurricane Hugo, St. Croix Foundation has been a visionary of social change and community development, working with community partners to challenge the status quo in order to address key priority areas including community and economic development, education reform, public safety, and nonprofit development. In line with the vision of its founders, (late community stalwarts Mr. Philip Gerard and Mr. Michael Neuburger), the Foundation continues to operate as a place-based hybrid-foundation, serving as a grantmaker as well as a project manager and direct service provider. One of the most important components of SCF’s work is providing fiduciary and fiscal sponsorship services to over 220 grassroots efforts, organizations, and charitable initiatives throughout the Territory. Today, the Foundation has expanded its programmatic portfolio to include providing support to a growing number of St. Croix’s nonprofits through its Nonprofit Consortium, a project which provides capacity building, technical support, and advocacy on the local and national stage. In total, over the past 28 years, the Foundation has been a conduit of $41 million private and public sector dollars invested into the U.S. Virgin Islands. The St. Croix Food & Wine Experience provides operating support to the Foundation so that it can continue doing all of its community-building work. Made possible by countless chefs, volunteers, corporate citizens, and loyal attendees, the Foundation is especially grateful for the Experience’s Platinum Sponsors including the Virgin Islands Department of Tourism, Southern Glazer’s Wine & Spirits, and the Caravelle Hotel and Casino; Gold Sponsors, Crucian Point, William and Kay Cook, and First Bank as well as valued Sponsors Bohlke International Airways, balter Restaurant, the Buccaneer, ProTouch Communications, Braata restaurant, The Virgin Islands Daily News, Crucian Gold, St. Croix Tourism, Tropical Shipping, and CULTIVATE Studio. Residents and corporate citizens interested in directly supporting work that addresses root causes and approaches rebuilding after the hurricanes through an equitable, community-based lens, are invited to become sponsors of The Experience. For information about, tickets, events, and sponsorship visit http://www.stxfoodandwine.com or call the St. Croix Foundation office at 340-773-9898. St. Croix Foundation for Community Development will be hosting its 3rd Annual Philanthropy Retreat February 14th thru February 17th on the island of St. Croix. The invitation-only retreat will connect National and International Senior Philanthropy Executives with Board and Staff of the Foundation’s Nonprofit Consortium partners. This year’s convening will feature Executives from Annie E. Casey Foundation, the Council on Foundations, the Southeastern Council of Foundations, the Association of Black Foundation Executives, TIDES Foundation, Global Giving, and Partnership for Southern Equity. As a vehicle for supporting St. Croix Foundation’s Nonprofit Consortium, which is an almost 3-year-old association of approximately 35 St. Croix nonprofits, the retreat will afford national funders insight into the inherent challenges and assets of St. Croix’s social and economic landscape. The theme of this year’s convening is Civic Excellence: Demonstrating Impact in Rural & Isolated Communities. Over the course of 3 days, nonprofits and Foundation Executives will convene around issues focused on diaspora philanthropy, social equity and nonprofit capacity building. The weekend will also include an island tour and a visit to the Agricultural Fair. To date, the Foundation has hosted over 15 Foundation Executives at past convenings. As a result of the first retreat, despite the lack of national media attention on the impact of the 2017 storms on the island of St. Croix, the Foundation had already secured several fierce champions on the mainland who knew St. Croix’s nonprofit landscape and knew the passion and potential of our civic leaders to meet the immediate needs of the most vulnerable residents in our community. Leveraging this work, in the fall of 2017, the Foundation applied for and was awarded its first major grant from W.K. Kellogg Foundation to support nonprofit organizations on St Croix in their recovery efforts. That Kellogg grant, along with funding secured from other national foundations after the hurricanes, translated into over $700,000 in grants to St. Croix nonprofits. Since hosting its first philanthropy retreat in February of 2017, exactly 7 months before Hurricanes Irma and Maria, the Foundation has developed some of its most enduring national partnerships. And, despite years of isolation from most national philanthropic organizations which have historically regarded the U.S. Caribbean as either irrelevant or international, St. Croix Foundation (assisted by the media attention from 2017’s hurricanes) is working tirelessly to change that trend. 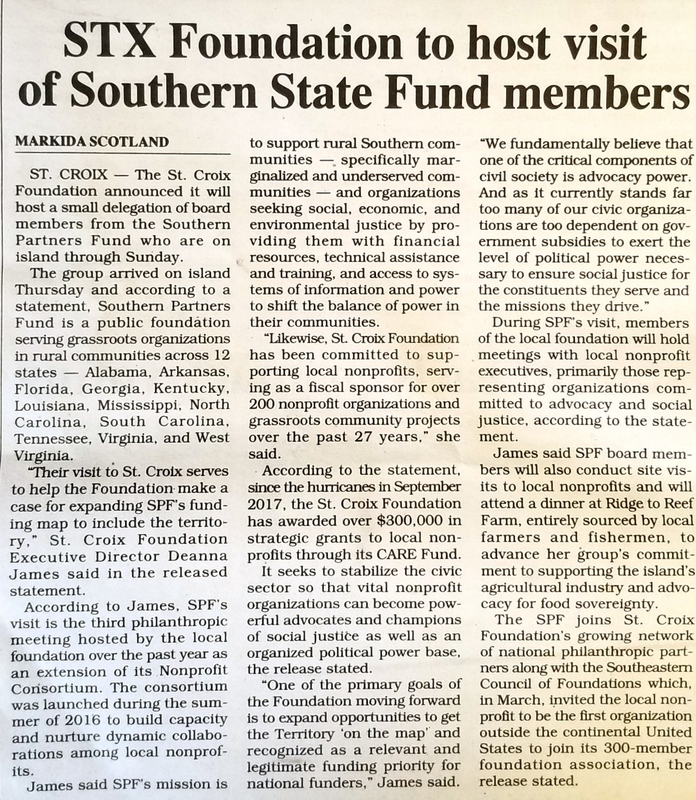 Additionally, in March 2018, St. Croix Foundation was invited to become a member of the Southeastern Council of Foundations (SECF), which boasts a network of over 300 foundations serving the U.S. Southeast. SCF is, today, the first and only territorial foundation to be a member of SECF. “Taking into consideration the demographic realities of St. Croix, with far greater needs and fewer economic resources, local nonprofits have had to rely on dwindling local government funding and fatigued corporate donors,” James stated. “St. Croix Foundation has become a steadfast advocate for the territory’s Nonprofit Sector, who we believe is essential in counterbalancing stretched and struggling governmental systems.” As a placed based operating foundation, St. Croix Foundation’s work is focused on holistic community development, providing not just grantmaking but broad-based support to nonprofits to allow for greater impact. St. Croix Foundation extends its sincere gratitude to its local, national, and international partners who have made this convening possible. For more information on the Retreat or on how to support the Foundation’s community rebuilding and Nonprofit Development efforts, please call the Foundation’s office at 340.773.9898 or visit their website at www.stxfoundation.org. In the spirit of giving back, the Foundation will launch ticket sales for the 2019 Food and Wine Experience Event on September 24th with a special 28 percent discount given to teachers and first responders for two of its most community-centric events- Sunset BBQ and Wine in the Warehouse. The discount tickets for teachers and first responders will extend through October 8, 2018 and can only be purchased at the St. Croix Foundation headquarters on the Market Square in Christiansted. As the Virgin Islands community marks the one-year anniversary of Hurricanes Irma and Maria, St. Croix Foundation for Community Development commemorates this marker with a note to the community outlining its recovery and rebuilding efforts and accomplishments in the aftermath of the storms. Over the past 12 months, the Foundation has worked tirelessly exercising its function as an operating foundation with a strict commitment to building a portfolio that extends far beyond grantmaking. Since the storms, the Foundation has focused mainly in three areas in order to maximize its impact with its nimble resources. Immediate Relief Projects – In the first 100 days after the hurricanes, the Foundation sponsored the shipment and distribution of approximately 250,000 pounds of food, water, clothing, baby supplies, and medical supplies. Grantmaking to Nonprofits– Since November of 2017, St. Croix Foundation has provided over $600,000 in grants to over 52 of St. Croix’s nonprofits for hurricane recovery. From reconstruction of facilities to vital programming and, perhaps most importantly, capacity building, the Foundation is strengthening nonprofits. Data Collection – To help assess the immediate impact of the storm and direct resources where they were most needed, St. Croix Foundation launched two surveys: one to evaluate unmet needs among households in areas hit hardest by the hurricanes, and the second to determine the capacity of St. Croix’s nonprofits as needs accelerated. In June of 2018, the Foundation officially published summary reports on both surveys, which are both being widely used by a number of civic and public-sector agencies. With numerous initiatives in the works, the Foundation remains grounded in its steadfast commitment to holistic development and to nurturing greater civic leadership as it expands its support for the nonprofit sector. Though the Caribbean Assistance and Recovery Efforts (CARE) Fund raised just over 1.6 million dollars, the Foundation leveraged those funds to do more than some organizations 10 times its size. In addition, it is also serving as the fiscal sponsor for hurricane specific charitable projects like the St. Croix Long-Term Recovery Group. To date, the Foundation’s sponsored projects have raised over $500,000 for their own hurricane recovery projects – all dollars that are directly serving residents in need, post-hurricanes. And a clean energy, community-based Solar Project, which will be launched to solarize neighborhood-based community centers. As the community reflects on the last year, the St. Croix Foundation would like to take the opportunity to extend its deep appreciation to its supporters, partners, friends, and donors including but not limited to Crucian Gold, ReV!ve, Limetree Bay Terminals, Diageo USVI, W. K. Kellogg Foundation, Newman’s Own Foundation, AARP Foundation, and Johnson and Johnson Foundation, for remaining at its side during this hard year of work. The Foundation remains committed to the Virgin Islands community and will work without pause for its betterment. The Foundation’s vision for the future and for St. Croix is a sustainable, progressive and prosperous community. The Foundation also thanks its peers in the work – the civic sector of the Virgin Islands – for demonstrating real philanthropy every day through their work. For more information on the Foundation’s CARE Fund and community work, visit www.stxfoundation.org or call 340.773.9898. The St. Croix Foundation is pleased to announce $11,000 in scholarships awarded to three St. Croix graduates on Thursday, July 26 at St. Croix Foundation’s headquarters in Sunday Market Square through the Patrick and Amelia Williams Opportunity Fund. The Patrick and Amelia Williams Opportunity Fund was established by Junior Gaspard and his family in honor of his grandparents, Patrick and Amelia Williams, whose work ethic, determination, and expectation of excellence led to educational opportunities for multiple generations. The Patrick and Amelia Williams Opportunity Scholarship’s goal is to provide opportunities to youth who have met obstacles but persevere despite these challenges and see educational pursuits as a means to achieving personal and professional success that can then be shared with the next generation. Joshua C. Parris, University of the Virgin Islands, Major: Criminal Justice. Aimed at supporting students who have had to overcome obstacles to continue their education, particularly in the aftermath of Hurricanes Irma and Maria, students had to meet specific requirements that included being a graduate from a St. Croix public high school and junior high school, maintaining a GPA of 2.0 or higher, demonstrating financial need, and most importantly, submitting personal essays that spoke to the reality of their challenges and their journey to pursue their dreams. All recipients are required to submit reports to the Foundation. A native of St. Croix and graduate of Central High School and John H. Woodson Junior High School himself, Gaspard and the rest of the Williams/Gaspard family wished to honor his grandparents in a meaningful way in the aftermath of the hurricanes of 2017. Launching a named scholarship fund would allow for a longer lasting impact on the lives of students in the community and allow the lessons learned from his grandparents about resilience and perseverance to be passed on to the next generation of leaders. For more information on St. Croix Foundation, please visit its website at www.stxfoundation.org or call the Foundation directly at 773-9898. The St. Croix Foundation is hosting a small delegation of Board members from the Southern Partners Fund from July 11th -15th. Southern Partners Fund is a 501(c)(3) public foundation serving grassroots organizations in rural communities across 12 states; Alabama, Arkansas, Florida, Georgia, Kentucky, Louisiana, Mississippi, North Carolina, South Carolina, Tennessee, Virginia, and West Virginia. Their visit to St. Croix serves to help the Foundation make a case for expanding SPF’s funding map to include the Territory. As an extension of the Foundation’s Nonprofit consortium, which was launched in the summer of 2016 to build capacity and nurture dynamic collaborations among local nonprofits, SPF’s visit represents the 3rd philanthropic convening hosted by the Foundation over the past year. Likewise, St. Croix Foundation has been committed to supporting local nonprofits, serving as a fiscal sponsor for over 200 nonprofit organizations and grassroots community projects over the past 27 years. More recently, the Foundation has deepened its commitment to building capacity and nurturing civic leadership within the nonprofit sector. Since the hurricanes, the Foundation has awarded over $300,000 in strategic grants to local nonprofits through their CARE Fund, seeking to stabilize their civic sector so that vital nonprofit organizations can become powerful advocates and champions of social justice as well as an organized political power base. During SPF’s visit, the Foundation will be convening intimate meetings with local nonprofit executives primarily those representing organizations committed to advocacy and social justice. SPF Board members will also conduct site visits to local nonprofits and will attend a slow down dinner at Ridge to Reef Farm entirely sourced by local farmers and fishermen to advance the Foundation’s commitment to supporting the St. Croix agricultural industry and advocacy for food sovereignty. According to St. Croix Foundation Executive Director, Deanna James, “One of the primary goals of the Foundation moving forward is to expand opportunities to get the Territory ‘on the map’ and recognized as a relevant and legitimate funding priority for national funders.” “We fundamentally believe that one of the critical components of civil society is advocacy power. And as it currently stands far too many of our civic organizations are too dependent on government subsidies to exert the level of political power necessary to ensure social justice for the consistuents they serve and the missions they drive.” James continued. The Foundation, through their Nonprofit Consortium, is working to elevate the efficacy and force of the nonprofit sector and in turn build a model for other communities’ recovery and sustainability efforts. Toward that end, SPF has already made a commitment to support the work of St. Croix nonprofits through several grant awards in partnership with St. Croix Foundation. The shared history of social and economic oppression has been a compelling case and rationale for SPF exploring ways to deepen their engagement with the VI. They join St. Croix Foundation’s growing network of national philanthropic partners along with the Southeastern Council of Foundations which, in March, invited the Foundation to be the first organization outside the contiguous U.S. to join its 300 member foundation association. In the upcoming weeks, the Foundation will be sponsoring additional convenings around the issues of civic leadership, collaboration and community vision building. St. Croix Foundation extends its deepest appreciation to Southern Partners Fund, to St. Croix’s nonprofits who continue to provide vital services to our community, and to the many corporate, foundation, and individual contributors who make St. Croix Foundation Nonprofit Consortium and CARE Fund possible. For more information on Foundation’s Nonprofit Consortium please visit www.stxfoundation.org or call the St. Croix Foundation at 340-773-9898. St. Croix, U.S.V.I. — St. Croix Foundation for Community Development is pleased to announce to the community the release of two reports that summarize the data collected in two surveys conducted post Hurricanes Irma and Maria: the Nonprofit Disaster Recovery and Capacity Assessment and the Individual and Household Needs Assessment. The survey was conducted within the first 60 days and during that time, the Foundation polled 28 nonprofits; although responses were limited due to communication interruptions, the organization was able to direct resources to 60% of nonprofits that responded to the survey. Armed with data, the Foundation provided referrals to DEMA (the Danish Emergency Management Agency) for repairs and mitigation work to stabilize facilities, such as a blue roof for the Caribbean Center for Boys and Girls and flood mitigation work for the St. Croix Landmarks Society. The Foundation also secured grant funding, provided free office space, and made vital connections for nonprofits based on the first survey. As efforts shifted from immediate relief to longer term recovery, the St. Croix Foundation launched a follow-up nonprofit survey asking in-depth questions to further understand the damages, losses, operational statuses, current needs, and more of local nonprofits. A total of 57 nonprofit organizations submitted surveys. The St. Croix Foundation is urging nonprofits to use this information as a tool to further capacity building and grant efforts, ultimately building a more resilient community. Cox stated, “This data has been invaluable in assisting the Foundation in knowing how to best support our nonprofits, how to be strategic with our grantmaking, how to advocate nationally for further support, and determining what technical or administrative assistance will have the most impact. It’s incredibly important to see the story, the people, behind the data.” The report provides data indicating that, 4.5 to 5.5 months after the storm, 73% of organizations polled were still operating on a limited basis or not at all yet almost 70% of organizations had seen an increase in demand for their services or programs. Also released today is St. Croix Foundation’s second report summarizing results from the Foundation’s Individual and Household Needs Assessment Survey. In an effort to fill the void of data collection regarding highly impacted neighborhoods and individuals and to streamline the supply chain of hurricane relief supplies, the St. Croix Foundation developed a survey to inform immediate relief strategies. To conduct the surveys, Foundation team members developed questions with input from community partners and then recruited and trained 50 volunteers to administer the survey with an emphasis placed on compassion, useful techniques, consistency in approach, and setting realistic expectations for residents about how the information being gathered would be used. Data was gathered using convenience sampling. Early on in the data collection phase of the project, volunteer surveyors were dispatched to community events where large groups of hurricane survivors would be gathered such as at free hurricane relief supply distribution events. Residents were typically approached for their voluntary participation in the survey while they were waiting in line. As data collection progressed, by early November shifts in recovery began to occur including an increase in power restoration, more residents returning to work, and fewer relief distribution events being held. At that time, SCF’s Disaster Resiliency and Recovery Coordinator reviewed the estates (neighborhoods) represented in the existing sample and strategically dispatched volunteers to locations to capture the needs of residents in areas that the Foundation knew to be hard hit but had been under-sampled or not sampled at all. In few instances volunteers were dispatched in teams for door-to-door outreach in targeted neighborhoods or housing complexes. An emphasis was placed on reaching low to moderate income residents to ensure their needs and perspectives would be represented in future conversations about recovery. St. Croix Foundation expresses deep gratitude to the partnering agencies that made both surveys possible. The vision could not have come to life without the support of volunteers and the community at large. The Foundation’s two surveys and accompanying reports were funded through the St. Croix Foundation’s CARE Fund, which is supporting holistic recovery through a community-based approach to future development. In the early days after the hurricanes, the Foundation’s CARE Fund facilitated the shipment and distribution of hundreds of thousands of pounds of food, water, clothing, baby supplies and medical supplies and sponsored the shipment and security of over 117,847 pounds of critical relief supplies. Today, the Foundation is supporting St. Croix nonprofits through grantmaking, technical skill development, and advocacy as well as serving as the fiscal sponsor for hurricane recovery projects such as the St. Croix Long Term Recovery Group. For more information on the St. Croix Foundation visit the Foundation’s website at www.stxfoundation.org or contact the St. Croix Foundation directly at 340-773-9898. Read the Nonprofit Disaster Recovery and Capacity Assessment Summary and the Individual and Household Needs Assessment Summary here.